This is a day that I did not want to remember. I found it hard to rally my energy to go to this dark place. 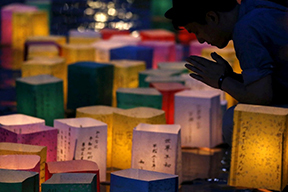 I did not want to remember the cruelty inflicted by my government on the people of Hiroshima and Nagasaki. I did not want to reflect on it because it makes me feel sad, defeated, and angry that US wars of aggression continue – now with cluster bombs, smart bombs, chemical weapons like white phosphorous and depleted uranium, the new scourge of weapon system drone attacks, and the use of unmanned vehicles. Worse, we still have a threat of nuclear war. Not just because of the countries that have weapons (Russia, US, India, Pakistan, and Israel) but also because the Obama administration is initiating plans to reinvest in nuclear weapons with upgrades projected to cost one trillion dollars and the warmongers are touting newer smaller nuclear weapons for precision use. The US is currently pressuring the Japanese prime minister to revoke Article 9. Article 9 came out of the post war Japan and was crafted with American diplomatic influence. It has been fiercely supported by the Japanese people especially, Japanese women. Article 9 became and continues to be part of the Japanese constitution. It declared that Japan would not make war. In a dramatic departure from its past, Japan ceased to be an aggressor country, and has not declared war on any other country for over 60 years. They have not lost any soldiers to war or killed any civilians. They have evolved from a defeated nation to an economic powerhouse. The quality of life for the people of Japan has improved dramatically. Their economy is not based on bloodshed, unlike the US that spends close to 60 percent of our taxes on war, and war-making. What will happen if the current Japanese administration dissolves article 9? It is feasible that this could galvanize a new arms race with Japan and its neighbors that will spur investment in weapons, posturing retaliation militarily rather than diplomatically. I speak as a member of Women’s International League for Peace and Freedom (WILPF) and a member of Community Church of Boston (CCB). Both organizations were born out of the efforts by pacifists and people who questioned the wisdom of war as a means to solve problems. WILPF began at the Hague in April of 1915 when over 1,100 women came together from 13 countries to try to stop World War I. CCB began in 1920 when similarly minded people joined together. CCB continues as a peace and justice organization as does WILPF. David Rauthauser is a member of both CCB and WILPF. He is also a documentary filmmaker. He recently released a film on the development and history of Article 9. He argues that we, the US could and should adopt Article 9. If the US adopted Article 9 we would end our wars of aggression. We could realize some of the same benefits as the Japanese. David also produced a documentary film on the survivors of Hiroshima and Nagaksi called the “Hibakusha Our Life to Live.” The film illustrates how the effects of war go on for decades. Approximately 6 years ago I went with a group of WILPF members to New York City to remember Hiroshima. We marched to the United Nations. I hadn’t thought much about the event in advance. I went there out of a sense of obligation rather than excitement. However, once I arrived, I was amazed to find that over 3,000 Japanese people had come to NYC because, remembering Hiroshima and promoting Article 9 is very important to them. They politely and insistently handed out peace cranes and leaflets on Article 9. They built a huge exhibit outside of the UN with a memorial and photos of the bombings of Hiroshima and Nagaski. One person thrust this book into my hand “The Day Never to be Forgotten: A Collection of Testimonies and Pictures by Sufferers of the A-Bomb of Hiroshima and Nagaski” with drawings and personal accounts compiled by Orizuru Volunteers Human Service Center, Kwansei Gakuil University.